Pewdiepie used to be pretty well known among gaming circles. You can say that he was internet famous. Now, he’s actually famous. 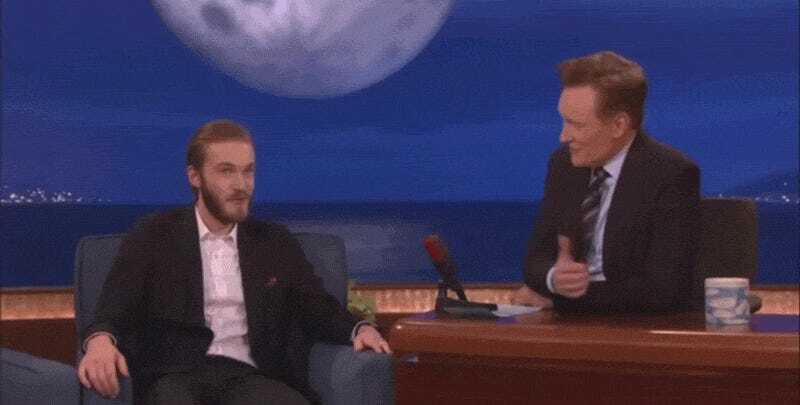 Last night, Pewdiepie appeared on Conan to promote his new YouTube Red series Scare Pewdiepie. What’s truly remarkable isn’t that Pewdiepie is a guy who made his name with funny and interesting “Let’s Play Videos” on YouTube or that he has over 42 million subscribers or that he’s launching a TV series on YouTube Red. What’s remarkable is how normal all of this has become. This wasn’t Pewdiepie’s first appearance on mainstream late night television. Last October, he appeared on The Late Show with Stephen Colbert. There were some good-natured cracks about “Let’s Plays,” but Pewdiepie wasn’t just there to explain internet culture. He was there to plug stuff (here, a new game and book), just like nearly every celebrity that appears on late night television. On Conan, the whole thing seemed even more normal and Pewdiepie seemed even more relaxed. And once again, he was appearing on late night television to promote a project, which is fine, because that, along with comedy, is what late night television is for. A lot of the “Wow, Pewdiepie is on TV” goes right out the door—not that this sort of validation was ever necessary anyway considering how large Pewdiepie’s audience is and how successful he is. In the past, people built their audiences over the radio, through television, or at the cinema. Now, you can add the internet to that list as just another medium where people an express themselves, reach others, and create a fanbase. No doubt, Pewdiepie will continue to appear in mainstream media. The idea of someone making funny “Let’s Play” clips on YouTube will continue to be less and less a novelty and Pewdiepie will be another normal celebrity, plugging his last show, book, whatever. And that’s okay.